Imaging of the hip is advantageous due to its close proximity with the ilium, sacrum, lumbar spine, and assorted muscle and soft tissues. It is highly recommended that multiple images of the hip be taken to ensure correct diagnosis. First, it is recommended that at least one wide field of view be taken to encompass the entire ilium, sacrum, and hip. Second, a more specific image of the suspected region of involvement, which will allow for inspection of the suspected dysfunction. Osteoarthritis (OA) is a multi-factorial condition that is essentially breakdown of hyaline cartilage along articulating joints, and is imaged most often with a radiograph or MRI. Radiographs are the most commonly used source of imaging for hip OA due to its ease of operation, low cost, quick results, and relatively high degree of accuracy. However, an MRI is considered the gold standard for hip OA since articular cartilage is visible and has a much higher resolution of surrounding tissues. There are multiple criteria that are used for OA, including multiple clinical predction rules that incorporate limited hip internal rotation, hip pain with certain activities, and stiffness in the morning for 60 minutes or less. 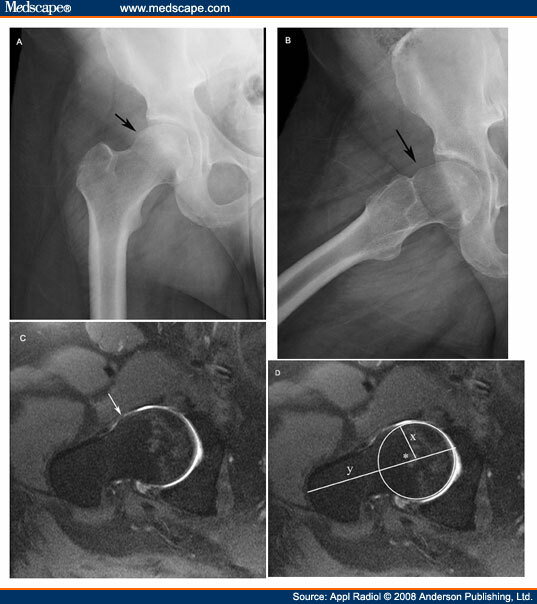 Research indicates that imaging techniques for hip OA usually have high sensitivity, but at the cost of lower specificity. Trochanteric bursitis/tendonitis is inflammation of the large bursa by the greater trochanter or tendons around the same region. Clinically, trochanteric bursitis will likely be positive with max hip flexion, adduction, and internal/external rotation; as well as positive palpation to the affected bursa or tendon. In addition, tendonitis should have a positive isometric contraction with activation to the affected muscle(s) only. Radiographs are not as helpful in diagnosing trochanteric bursitis, as soft tissues and muscle are not visible to any degree. A T2 weighted MR image is considered the most beneficial when suspicious of hip bursitis and/or tendonitis due to its ability to detect edema and asymmetric sites of fluid accumulation. A fluid sensitive T2 would be beneficial to detect muscular strain, tears, or soft tissue lesions that may accompany trochanteric bursitis. This MRI technique allows for high sensitivity of detecting trochanteric bursitis. 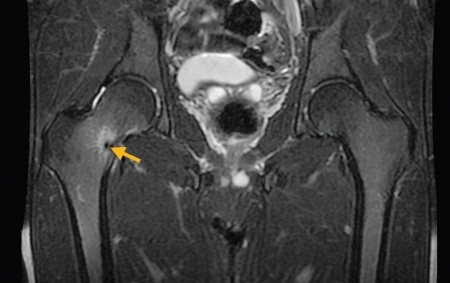 Figure 4: Coronal T2 weighted MRI of Trochanteric bursitis. Evidence of bursitis from edema and inflammation in the left hip, with no apparent bone pathology. Reprinted from tall et al, 2011. 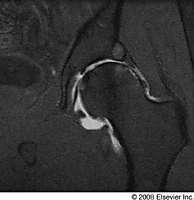 Labral tears are viewed with a conventional MRI (Figure 5) or MR arthrogram (MRA) (Figure 6). Clinically, you would suspect a labral tear with consistent clicking, catching, or locking of the hip joint. The clinician will further suspect a labral tear with a positive hip scour test and/or modified hip circumduction test. In a conventional MRI, labral tears are continuous with the adjacent capsule and bony cortex, and therefore difficult to detect. An MRA should be considered before conventional MRI, as it is more specific and anatomical structures are more clearly delineated. MRA utilizes a dilute gadolinium solution and is injected around the hip and imaged in the same method of the conventional MRI, providing optimal visualization of the labrum and surrounding cartilage. The sensitivity of conventional MRI was 30% with an accuracy rating of 36%, whereas sensitivity and accuracy of MRA for diagnosing hip labral tear were 100% and 94% respectively. Figure 5: Hip labral tear examples. A) Hip labral tear in sagittal proton density weighted MRI sequence. B) Hip labral tear in axial proton density weighted MRI sequence. C) Hip labral tear with adjacent paralabral cyst in sagittal proton density weighted MRI sequence. Reprinted from tall et al, 2011. Figure 6: Hip Labral tear. Sagittal T1-weighted fat-suppressed image from MR arthrography of the left hip. Reprinted from Omar et al, 2008. 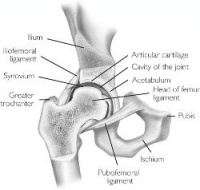 Simply stated, a femoroacetabular impingement is a morphological impairment of the femoral head and acetabulum. This conditon is hard to detect clinically without imaging, as it often goes unnoticed until the condition has caused other pathology such as a labral tear. Thus, imaging of the hip is crucial with failure to respond to conservative treatments, as conditions such as femoroacetabular impingement will likely continue to cause damage. An oblique (10° oblique from the midline) axial MRI sequence of the acetabulum is the most appropriate imaging for femoroacetabular impingement, since it allows calculation of the alpha angle. (Figure 7) The alpha angle is the angle formed by the femoral head and the center of the anatomical neck. A normal alpha angle is considered 55° or less. There are multiple types of abnormal shapes the femoral head presents with to lead to femoroacetabular impingement. The “cam type” involves wedging of an abnormal shaped femoral head into the acetabulum, which is most pronounced during hip flexion. This leads to chondral and labral injury secondary to shear forces. The “pincer type” (common in middle-aged women) involves excessive contact between the acetabular rim over the femoral head and neck junction, resulting in a pinching of the labral tissue. There was found to be 86–92% sensitivity in the detection of femoral and acetabular cartilage abnormalities including femoroacetabular impingement using axial MR imaging. 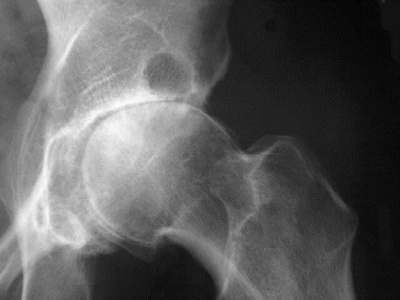 Hip fractures encompass a wide range of variety of types and imaging techniques. 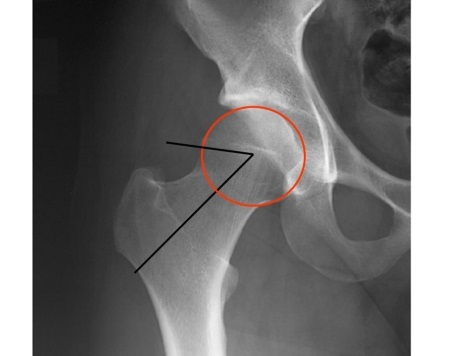 The most common types of hip fractures include stress fractures and occult fractures (not detectable via radiograph). Initially, radiographs are usually taken if fracture is suspected due to ease of use and immediate results. However, radiographs have a poor reliability of picking up fractures in early stages. MRI is considered the gold standard due to high sensitivity in detecting hip fractures. Berger et al demonstrated that radiographs had a sensitivity of 15–35% on initial examination of stress fractures, increasing to 30–70% on follow-up visits. The same study also indicated MRI having a specificity of 86%, sensitivity of 100%, accuracy of 95%, positive predictive value of 93%, and negative predictive value of 100%. It is suggested that the best method of detecting occult fractures is a combination of a T1 and T2 weighted MRI. This allows the differentiation of fractures versus soft tissue injuries, and is important as it will significantly alter the course of intervention. 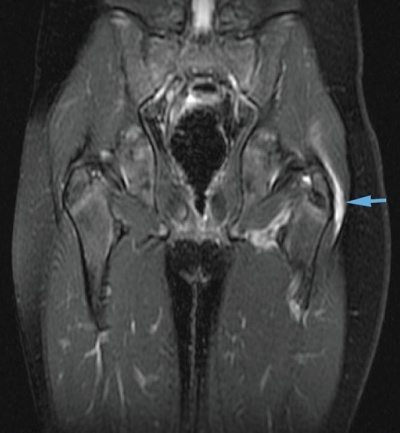 Figure 9: T2-weighted MRI indicatin8g R hip stress fracture and small amounts of edema. Reprinted from Taylor-Haas et al, 2011. ↑ 1.0 1.1 1.2 1.3 1.4 1.5 Tall M a, Thompson AK, Greer B, Campbell S. The pearls and pitfalls of magnetic resonance imaging of the lower extremity. The Journal of orthopaedic and sports physical therapy. 2011;41(11):873-86. Available at: http://www.ncbi.nlm.nih.gov/pubmed/22048192. Accessed March 18, 2012. ↑ 2.0 2.1 Recht MP, Goodwin DW, Winalski CS, White LM. MRI of articular cartilage: revisiting current status and future directions. AJR. American journal of roentgenology. 2005;185(4):899-914. Available at: http://www.ncbi.nlm.nih.gov/pubmed/16177408. Accessed March 24, 2012. ↑ Grainger a J, Elliott JM, Campbell RS, et al. Direct MR arthrography: a review of current use. Clinical radiology. 2000;55(3):163-76. Available at: http://www.ncbi.nlm.nih.gov/pubmed/10708607. Accessed March 18, 2012. ↑ 4.0 4.1 Chan Y-S, Lien L-C, Hsu H-L, et al. Evaluating hip labral tears using magnetic resonance arthrography: a prospective study comparing hip arthroscopy and magnetic resonance arthrography diagnosis. Arthroscopy : the journal of arthroscopic related surgery : official publication of the Arthroscopy Association of North America and the International Arthroscopy Association. 2005;21(10):1250. Available at: http://www.ncbi.nlm.nih.gov/pubmed/16226655. Accessed March 24, 2012. ↑ James SLJ, Ali K, Malara F, et al. MRI findings of femoroacetabular impingement. AJR. American journal of roentgenology. 2006;187(6):1412-9. Available at: http://www.ncbi.nlm.nih.gov/pubmed/17114529. Accessed March 24, 2012. ↑ 7.0 7.1 7.2 7.3 Berger FH, de Jonge MC, Maas M. Stress fractures in the lower extremity. The importance of increasing awareness amongst radiologists. European journal of radiology. 2007;62(1):16-26. Available at: http://www.ncbi.nlm.nih.gov/pubmed/17317066. Accessed March 31, 2012. ↑ Ohishi T, Ito T, Suzuki D, Banno T, Honda Y. Occult hip and pelvic fractures and accompanying muscle injuries around the hip. Archives of orthopaedic and trauma surgery. 2012;132(1):105-12. Available at: http://www.ncbi.nlm.nih.gov/pubmed/21874573. Accessed March 31, 2012. ↑ Taylor-Haas J a, Paterno MV, Shaffer MD. Femoral neck stress fracture and femoroacetabular impingement. The Journal of orthopaedic and sports physical therapy. 2011;41(11):905. Available at: http://www.ncbi.nlm.nih.gov/pubmed/22048418. Accessed March 18, 2012.